Student Spotlight: Brianne Disney | The Pinnacle P.O.V. When did you start at Pinnacle? I started (attending Pinnacle) back in February. 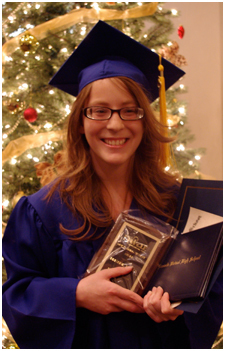 I finished my second semester of Jr. year and then completed my full Senior year to graduate in December 2009. I went to a regular high school near me. I was behind in some classes and decided to give online education a try again. I had previously tried another online school in AZ and I was unsuccessful. So I heard about Pinnacle and decided to give them a try. I really enjoyed my first semester at Pinnacle and I was successful. After that I decided to stay for my senior year. Why did you choose Pinnacle? My school counselor mentioned Pinnacle to me. After trying it for one semester, I decided to stay. I chose Pinnacle because I did really well and I wanted to graduate early. What was your favorite thing about Pinnacle? I really liked the people at Pinnacle, including the instructors and staff. They do an exceptional job communicating with the students and parents. I really felt like they cared about me and wanted to help me be successful. I also liked the fact that the online courses were self-paced. Having them online helped me stay independent as opposed to being in a regular classroom setting. You just graduated from Pinnacle, what are your plans now? I’m going to attend Chandler Gilbert Community College for Spring 2010; I’m undecided right now, but I’m thinking about business or interior design. She enjoys spending time with friends and family. She also likes to write scripts and stories during her free time. Brianne was born in Davenport, IA and moved to AZ in 1997. ~ by pinnaclepov2224 on December 30, 2009. Nice article, Happy New Year 2010, cheers.